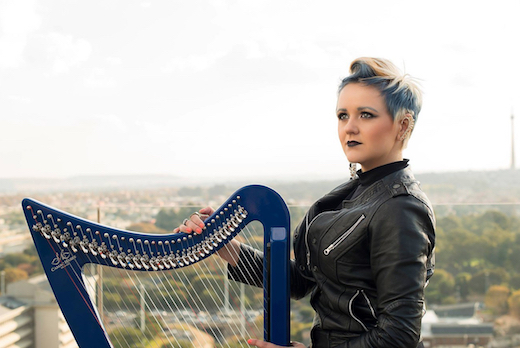 From playing rugby to playing the harp, Jude's versatile talents are astounding! Winner of numerous national and international awards and scholarships, Jude Harpstar's (Judith van der Wat) unconventional style and astonishing talent on her electro/acoustic harps and piano, ensure that every performance is riveting. This master of improvisationís incredible ability to play any style of music ensures that every show is a success. We stole a few moments of her time to find out a bit more about her. Gigster Online (GO): Who is Jude Harpstar? Jude Harpstar (JH): Jude Harpstar is a "one-of-a-kind" harpist/artist who sees herself as a chameleon in the entertainment world. She is a classically trained pianist and harpist, but what really stands out about her is her ability to improvise over and embellish any genre thrown at her at the drop of a hat, from Classical to Jazz to Hip-Hop to House to Pop to Rock to World Music. She has a passion and enthusiasm for performing, fashion and singing jazz tunes. Jude Harpstar also produces and composes and loves collaborating with various artists and celebrities. GO: What can you share with us about yourself that most of your fans/followers don't already know? JH: I can sing two notes at the same time. I played rugby at university. I was in a pop/hip-hop dance crew in America. I love burning incense/essential oils. GO: At what age did your passion for music start? JH: I believe my passion for music started in my mother's womb when she was busy practicing for her piano exams. I was about 3 years old when I asked my mom if I could start playing the piano. I started lessons at age 5. GO: What instrument would you have loved to learn to play, if not the harp and piano? JH: I absolutely love Spanish guitar. So, it would have to be guitar, or the sitar. Sipho "Hotstix" Mabuse actually gave me a sitar. I just need to have it repaired. GO: You have certainly taken the harp out of its "box"; how difficult is it to essentially create a new genre with such an "old" instrument? JH: People have a certain perception of the harp and where it "belongs", but that has certainly changed in the last few years with harpists doing all sorts of cool things with effects pedals, covers of heavy metal/pop songs etc. I think it's essential to keep evolving and trying new things. There are so many exciting creative projects that you can join if you keep an open mind about creativity. I think it's tricky to create a new genre, however, one can always bring a fresh approach/sound to a genre. GO: Having won so many national and international awards and scholarships, is there any one achievement that stands out of which you are most proud? JH: The award/scholarship that stands out the most for me is the full scholarship I won to Interlochen Arts Camp in 2004. It changed my life forever as it was the beginning of my epic 7-year journey in America. GO: You've also performed with so many local and international legends, is there any favourite performance that comes to mind? JH: One of my favourite performances thus far has to be either Macufe Festival with Sipho "Hotstix" Mabuse or Gregory Porter at Joy of Jazz Festival. I did a performance with KWESTA at KONG nightclub which was also epic. GO: At the tender age of 15, you were already performing at The Eighth World Harp Congress in Geneva, Switzerland. At what age did you first start performing and were you nervous being so young? JH: I started performing at age 6/7. I've never really been nervous when having to perform. I do sometimes get butterflies but as soon as I am with my instrument, I am totally calm. GO: What other interests/hobbies do you have besides music? JH: I love making/eating food, creating mandalas, reading about esoteric/spiritual subjects, going to the gym, dancing, collecting crystals and dressing up/doing makeup. GO: You joined Gigster quite recently; what do you think of the platform thus far? JH: I am very impressed with Gigster in terms of the layout of the website and how the profile of each artist is so concise and easy to navigate. I love the fact that the contract between client and artist covers everything and that Gigster makes sure that your profile is always immediately updated. Very professional. I love that I can see exactly what fee Gigster makes on top of my fee. Gigster is transparent, which is fantastic. JH: I am hoping to do a lot more high-profile collaborations, composing and producing a lot more music, starting up a DJ and Electro Harp duo with two different DJs and recording an album with a South African legend. With her signature style, extraordinary talent and wonderful collaborations with several big names in the music industry (think Sipho "Hotstix" Mabuse and Pops Mohamed), it's certain that we will be hearing a lot more from her in the future.